Pictures of the Etruscan rock tombs of Cerveteri, Italy. Cerveteri was a city state that in 600 BC had a population of between 25,000 - 40,000 people. Its citizens built a cemetery known as the Necropolis of Banditaccia starting in about 900 BC. The early burial chambers were simple pits to hold the ashes of the dead but by the 5th century BC the Etruscans had built a sophisticated necropolis that mirrored the city of Cerveteri itself. Each family dug house shaped tombs out of the volcanic tuff rock that were replicas of their real houses. The first tumuli were cut out as round buildings that were the same shape as early Etruscan houses that had a cone shaped thatched or tiled roofs. Inside these rock tumuli the Etruscans cut chambers that were like rooms with stone beams like the wooden ones in their real houses. Between these beams tile shapes were carved to represent the inside of tiled roofs. In the Tomb of Reliefs household implements were carved in relief onto the walls and pillars of the tomb chamber. Niches are cut into the wall with pillows cut out of the stone to make them look like bed chambers. Sarcophagi are cut out of the rock which would have held the ashes of the deceased. Benches have been cut to hold cinerary urns and grave goods. When Etruscan tombs were excavated in the late 1700s thousands of pots black figure and red figure vases were found. Initially designers like the Adams Brothers believed they were Etruscan and it was a lot later that archeologists traced the vases manufacture back to Greece. The Etruscans loved Greek vases and a very high percentage of all know black and red figure vases in museums come from Etruscan tombs. So popular was the design that Greek potters moved to Etruria and set up workshops. The Necropolis of Banditaccia at Cerveteri is built like an Etruscan City with streets and different quarters. Later Tumuli were built in rows of square shaped tombs, known as “dado" or dice tombs. These run in rows along the streets just as real houses did. As no Etruscan cities exists today the Cerveteri Necropolis s the only way that historians have come to understand how Etruscan cities looked. Many cities still have Etruscan Street plans such as Pompeii, but later Roman settlers built over the earlier Etruscan buildings. 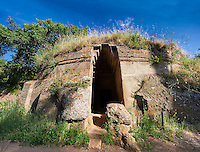 Download pictures of Etruscan rock tombs of Cerveteri as stock photos or buy as photo wall art prints on line. 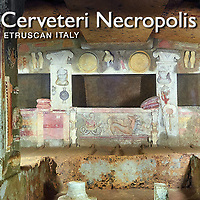 Cerveteri is a UNESCO World Heritage Site.